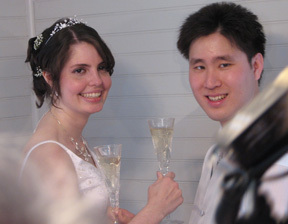 Jennifer Morgan and Winston Cheng were married on Saturday, March 11, 2006. The ceremony took place at Maclay Gardens, just north of Tallahassee, at 2:00. 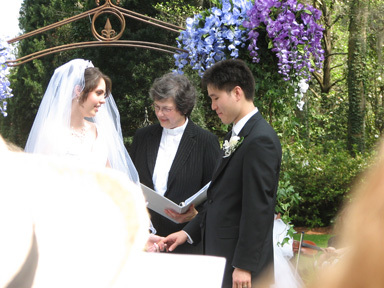 The ceremony in front of the Reflecting Pool in Maclay Gardens was officiated by the Rev. Pam Wellons of St. Stephen Lutheran Church. Matron of Honor Lisa Geoghegan (for whom Jennifer served as Maid of Honor last year), Maid of Honor Monica Morgan (Jennifer's sister), and Bridesmaids Lauren Sampson and Erika Andersen. Winston's Best Man was Jan Hroidel, and other Groomsmen included his brothers Jimming and Warren, and Andrew Hsia. Elisabeth Manley (Jennifer's cousin) read a Bible passage, and the Shelley Weiss string quartet provided the music. The wedding ceremony was preceded by a bridal luncheon, a rehearsal, rehearsal dinner, and followed by a reception at Maclay Gardens, and a dinner party, and a brunch the next morning. 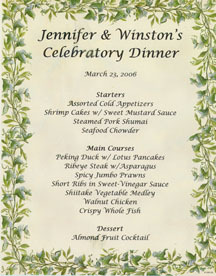 Jennifer and Winston left for their honeymoon on Monday the 13th. They will live in Falls Church, Virginia, where Winston works for a computer software company. The Knot Winston set up a web page at The Knot's site to help coordinate wedding plans. The Wedding The processional included the entrance of the Groom's and Bride's attendants (to Pachelbel's Canon in D), and the entrance of the Bride and her father (to Clarke's Trumpet Voluntary). Pastor Pam explained the purpose of the ceremony and led the Declaration of Intention, and Jennifer's cousin Elisabeth read from 1st Corinthians, Chapter 13. Jennifer and Winston exchanged vows and rings, and lit a unity candle to symbolize their new life together. Pastor Pam then led the group in prayers and the benediction, and the wedding party left to the sound of Beethoven's Ode to Joy. More Pictures available on the Morgan Webshots pages: see Volumes 1, 2, 3, and 4 of "2006 Jennifer's Wedding"
The Reception We used the Gardner's Cottage at Maclay Gardens for the reception, and spread out to an adjacent tent where a DJ played music and a many people danced, ate, and visited. More Pictures available on the Morgan Webshots pages: see Volumes 5, 6, 7, and 8 of "2006 Jennifer's Wedding"
Dinner Party A dinner party at Nicholson's farm house gave many of the younger set a chance to party with Jennifer and Winston while enjoying more good food. Brunch Many of Winston and Jennifer's friends and relatives from out of town gathered at our home to eat, catch up on old times, and open a few wedding presents. Many in-town friends joined us too. 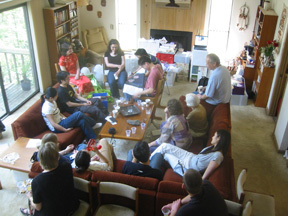 A number of people brough additional food, and we all had a great time. Honeymoon One of the wedding gifts was a pair of round-trip tickets to Hawaii. Jennifer and Winston spent most of the week in the "Garden Isle" of Kauai. Things grow well there in part because of abundant rainfall, and they had even more than usual. It was worse on the north side, where a dam broke and roads were washed away; on the south side, they saw enough of the island to enjoy it. Celebratory Dinner Winston's father, Bin Luh Cheng, hosted a dinner at Lucy Ho's restaurant to present Winston and Jennifer, and Jennifer's parents, to a large group of his friends. About sixty of us sat around five large tables with "lazy susans" in the middle so we could easily chair the delicious food. 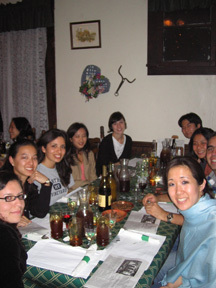 The traditional Chinese dinner included a wonderful variety of appetizers and entrees, and dessert.